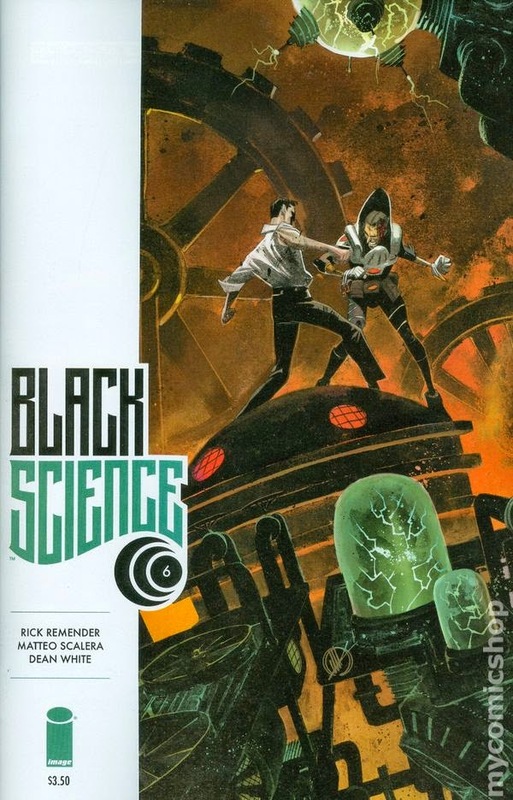 Black Science #6 - Written by Rick Remender, illustrated by Matteo Scalera, painted by Dean White, lettered by Rus Wooton, edited by Sebastian Girner, published by Image Comics. The thing that struck me the most about the first issue of this amazing series was that from the moment I opened the cover, I felt like I had jumped from my spot on a tranquil beach into a speeding roller coaster car. Not only that, once on the ride, I had to frantically buckle myself in, pull down the safety bar, and keep my arms and hands inside the car at all times as the story launched into some sharp turns and a few loop-the-loops to boot; I love that issue because of this. Enough of the metaphors and clichés, though, just know that the series begins with action and that action carries you through to the end of the book. Now, issues two through five have action, yet nowhere near the levels of the first, but the concluding chapter for the first arc once again thrusts you into the adventure for the entire issue, right before it—okay, back to metaphors—punches you in the stomach right as you attempt to catch your breath. Boy howdy…I was not expecting what happened at all! Grant has finally had it with Kadir. Having learned last issue that Kadir was the one who sabotaged the Pillar, Grant blames the man for their world jumping plight and the deaths of some of his team members. Although Kadir is a monumental a_hole, he had his reasons; some of them were even quite valid. It’s too late to reflect on that now, as Grant and Kadir plummet into a frozen volcano as scores of fire-eyed science monkeys (yes, I can’t believe I just said that either) gaze at the intruders in confusion. It’s a battle to the death as the two humans fright both each other and the odd monkeys, but the clock is ticking before the next jump; what they find in the depths of a secret laboratory will shock them to their core. <wheez> Hold on a second, denizens. <huff><puff><huff> Let me just catch my breath. Okay, this issue is gnarly. Not only do we start with action that flows beautifully from beginning to end, the creators share key character moments with some of the secondary cast, throw in a crazy revelation about one particular monkey, and slap us with an event that I can barely keep myself from spoiling—trust me, it’s monumental. Criminy! As much as I wanted to stay and see all this world has to offer with these…altered…monkeys, the clock running down alongside the manic fight-flight-fight-flight pacing of the story gave me a momentary glimpse into the weird I was craving. More than that, I was more desperate to see how things turned out with Grant and Kadir, than I was to see even more of the monkeys, the plants, and—sorry, not gonna spoil things this time. Just know that the strength of the creators’ craft kept me focused on two men having an argument, as opposed to the unbelievably insane things going on around them; this is not an easy thing to do. Every aspect of this issue works, whether it is Remender’s thought captions, dialogue, and the aforementioned pacing. Scalera’s acting and storytelling is even stronger than in previous issues, which is mind boggling, and White’s painting brings in all of the stunning blues and magentas that captured my attention back in the first issue. Us lucky readers get a tremendous story that will elicit gasps, and that is guaranteed to leave you saying, “Holy smokes…I can’t believe the creators did that…or that…or THAT.” All I know, is that it will be a long painful wait until issue seven drops in July. If you have not been reading Black Science—go to your room without supper—then I’m certain a trade will be appearing in the near future. Black Science is a action-packed, rip-roarin’ comic that is not to be missed. VERY HIGHLY RECOMMENDED! 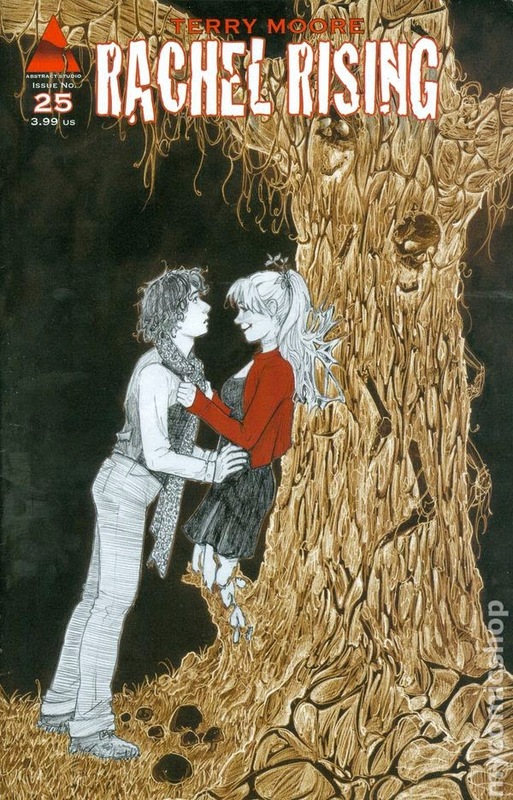 Rachel Rising #25 - Everythinged by Terry Moore, published by Abstract Studio. I love this series. I love this creator. If anyone says I don’t…well, them’s fightin’ words, denizens. Rachel Rising wrapped its first main arc last month and let me tell you, it was heavenly. Moore’s issue 24, aside from giving me some future nightmare-inducing imagery, wrapped up much of the storylines centering around Lilith. This does not mean there’s nothing left to tell going forward. The opposite is true; there are even more mysteries surrounding Rachel, her friends, and the town of Manson. We still do not know who killed Rachel, or the nitty-gritty details concerning Zoe, or what’s up with Malus, but now we learn a recent life-changing event might not be what it seemed. Rachel Rising continues to be a great read, and this is in spite of the fact that this issue is considered by Moore to be a jumping on point for new readers. But you owe it to yourself to read the dang-amazing first 24 issues, which are available over four trades…trust me, denizens, you’ll thank me for this. Yes, I can see jumping on at this point, and Moore cleverly hides the exposition to bring newbies up to speed—a very hard thing to do—but there are so many beautiful, haunting, humorous, and suspenseful character and story moments worthy of your time, that you really should not skip those first 24 issues. Amy the intern (my wife) will have hammered through all four trades within two weeks—this is with barely any time in her schedule—and she is loving every moment of the book. I remember all the moments Moore’s series made me gasp out loud, and listening to Amy read this book, with each “Oh my God,” “Not Aunt Johnny, I love Aunt Johnny,” “This is freaking me out,” and “I love this book” tells me that, yup, she kind of likes Rachel Rising, too; this is coming from someone who does not generally like horror. Don’t miss out on experiencing this series from the beginning is all I’m saying. Anyhow, this issue brings all the charm that keeps me loving these characters, while introducing a new twist that gave me a What?! No way! moment and an eagerness to see what happens next. Sure, we skipped over how Rachel found the dog that harnessed Aunt Johnny’s soul, and how the soul was returned to her vacant body, but that’s okay, there’s a new concern that the poisoning might not have occurred exactly how they believed. The moments with the twisted Zoe smoking a cigar and disposing of the rats, although completely messed up, had me rolling with laughter as I appreciated every line of the gorgeous art and every line of brilliant dialogue. The story, the art, the subtle character acting make Rachel Rising one of the best books on the stand, and one that rises to the top of my read pile with every new issue. This is as “creator owned” as it gets, and I encourage everyone to give this monumental series a read. VERY HIGHLY RECOMMENDED! Southern Bastards #1 - Written by Jason Aaron, art and color by Jason Latour, lettered by Jared K. Fletcher, color assist by Rico Renzi, edited by Sebastian Girner, published by Image Comics. Image pulls out yet another stellar #1 offering with Southern Bastards, only this time from Jason Aaron, on his first creator-owned project, and Jason Latour. Unlike the fantastic host of comics released from Image over the past two years, you will not find aliens, magical weapons, supernatural creatures, robots, time travel, irradiated teens, capes, or any sort of kaiju. Nope. This comic is set around characters and situations that could possibly exist. We’re talking about a facet of reality here, which is all sorts of terrifying. Yes, denizens, we’re talking about the deep, deep South, and it ain’t pretty. After far too many years, Earl Tubb has returned to Craw County, Alabama to pack up his deceased father’s house, now that his Uncle Buhl is in a nursing home. It’s been decades since he left, right after his father was killed performing his duty as sheriff. Apparently, Earl ain’t been gone long enough. Within hours Earl has had a run in with a wicked former classmate who has got himself into all sorts of trouble, trouble that looks to envelop Earl in its voracity. It’s only the first issue, and the creators have pulled me in for the ride. We only get brief glimpses into the character of Earl, and Dusty for that matter, but it’s too early to fall in love with any of the characters as of yet; I’m guessing that will come in time. What attracts me to this solid first issue is the setting, the hints of past events, and the current hierarchies that all look to collide with Earl now that he has returned to the place he never wished to see again. Aaron’s dialogue and characterization are wonderful and Latour’s art/colors are striking, whether he is drawing a full-page splash of a dog taking a dump on a lawn, or depicting an uncomfortable conversation at the local BBQ—which looks to be a major location in the future. I have no idea what “fried pie” is, but dang if I don't want one; that is a separate matter. Thus far, all I know is Earl looks to be sticking around Craw County for more than three days, and given this intriguing start to the series, I know I’ll be back next month to see what this “Boss” character is all about. 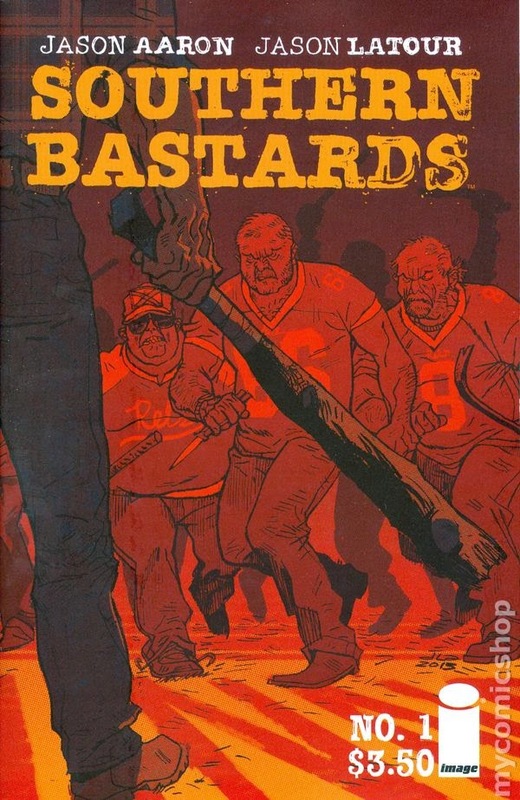 If issue one of Southern Bastards is any indication of what’s to come, I would suggest picking up this book immediately before it vanishes from the shelf, as it looks to be something special. HIGHLY RECOMMENDED! 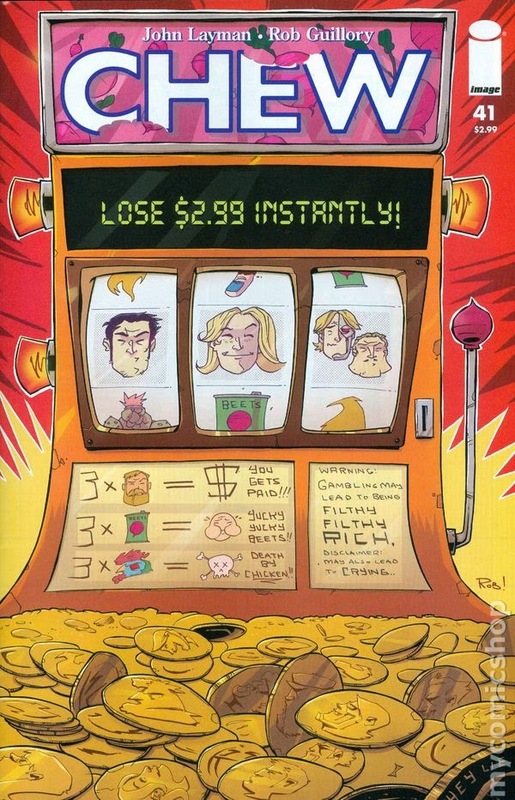 Chew #41 - Written and lettered by John Layman, illustrated and colored by Rob Guillory, color assists by Taylor Wells, published by Image Comics. Okay, I already mentioned there might be spoilers up near the top of the page, and yup…spoilers. Tony and Amelia got hitched in Vegas, baby! Not only that, after the major bust Tony and Colby intentionally made while trippin’ balls on chog-basted space fruit has garnered them a certain sense of notoriety. Unfortunately for their director, Applebee, chief director Lamode is also there and the man doesn’t like Applebee all that much. Poor Applebee. He’s inconsolable, but that just means it’s time for liquid courage. Finally, after foiling a plot by the Collector, Tony and Amelia discover that love is most definitely in the air. <sniffle> I’m cryin’, denizens. Not out of sadness, and not out of joy—I am happy for Tony and Amelia, though—but from laughing from the first page to the last. Every panel of every page has something clever or crude, blatant or hidden and it all brings a smile to my face. If you’ve been reading FSoH/SitW for any length of time, then you know that I love this series and have since I first set eyes on issue one. The characters and the story are wacky, they are just out there, man, but above all they are compelling. As often as the series plays events for laughs, there are those few moments that are terribly sad, like when a loved character dies, and you feel so very sorry for those who survive as their grief envelops them. Then the laughs come, and you are once again rooting for the hero to right the wrongs. As I say with every issue of Chew I review, you will not find anything like this book on the stands. It is unique, it is gross, it is fantastic, and if you have not been reading this remarkable achievement from Layman and Guillory, then you have really missed the boat. Never fear, you can pick up the trades, or better yet buy the hard cover Omnivore Editions…like the ones I bought! After 42 issues (including the must-own Secret Agent Poyo Special! ), I begin to run out of new things to say about this great comic book series, but that’s okay. My work is done just so long as a new reader decides to give Chew a shot. HIGHLY RECOMMENDED! Deadly Class #4 - Written by Rick Remender, illustrated by Wes Craig, colored by Lee Loughridge, lettered by Rus Wooton, edited by Sebastian Girner, published by Image Comics. Hey kids, don’t try this at home. Actually, don’t try any of this at home, out of your home, or at anyone else’s home. I ain’t just talkin’ about all the rampant drug use in this issue, I’m also talking about becoming assassins. Just. Don’t. Do. It. Also, kids, don’t go to Vegas; don’t even think about going to that den of sin. Stay home, stay in school—NOT one for assassins, mind you—get some kind of pet like a fish. Most of all kids, never go to a Grateful Dead show, or whatever it is for passes for one these days; no good will ever come of it. After reading Remender’s heartfelt note at the end of the first issue, I have a sneaking suspicion that some/much of this issue stems from personal experience. Remender continues to deliver amazing dialogue and phenomenal character development moments. Craig’s art takes the gorgeous, dynamic storytelling of the first three issues and adds in plenty of psychedelics to drive home the (altered)state of Marcus’s mind at the key moments. Craig’s standout pages are when Marcus—who is trippin’ balls—and his crew arrive in Vegas. Much of the impact is expertly hammered home through Loughridge’s amazing colors that are both beautiful and horrifying; it’s a miracle Marcus isn’t permanently driven mad over the experience. By the end of the issue, you have a shining example of what happens when all of the creators are perfectly in tune with the story being told. Deadly Class is yet another amazing Image Comics offering. If you are fine with a book about teenage assassins and are cool with rampant teen drug use depicted in an all-too-realistic manner, then this is the book for you. 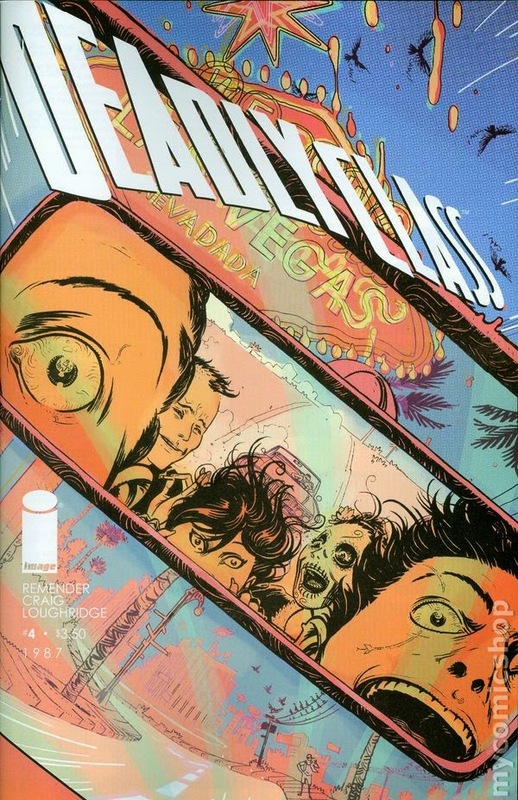 Especially after this issue, Deadly Class is The Breakfast Club meets the early years of Gross Pointe Blank meets Fear and Loathing in Las Vegas. If any of those movies or the subject matter scare you, then this might not be the book for you; I’m also shocked you read my posts. If you like those movies, and you are a fan of expertly crafted comic book stories, then this is a comic you can’t afford to miss. HIGHLY RECOMMENDED! Still No Freaking Undertow #3 - What a revoltin’ development, I tell youse.